Mix the ground beef, soft bread crumbs, onion, 2 tbs of the au jus gravy mix and eggs in a large bowl. Divide meat into 6 equal portions and form patties. Heat 2 tbs. oil in a large skillet over medium heat. Brown patties on both sides. Remove from pan and set aside. In the same pan, saute the sliced onion and mushrooms for about 3 minutes. Add water and the remaining au jus mix; stir well. Place patties back in pan, cover and reduce heat to low and cook for 20-30 minutes. Place flour and water in a jar and shake well so there are no lumps. Remove patties from pan, turn the heat to medium-high and whisk the flour/water mixture into the pan juices. Whisk until gravy begins to bubble. Add Gravy Master if using. Add the patties back to the pan, cover and cook on low for 10 minutes (this cooks the gravy). 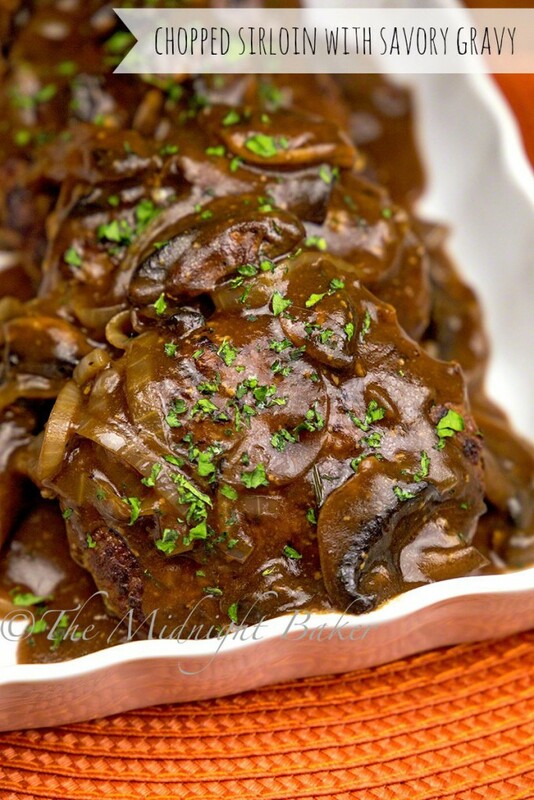 Slow Cooker Directions: Place water, onions, mushrooms and remaining au jus gravy mix in a 4-6 quart slow cooker. Brown the patties as in the main recipe. Place browned patties in the slow cooker. Cover and cook on low 6-8 hours, high 4-6 hours. To thicken gravy, remove the patties, turn the cooker to high and whisk in the flour/water mixture. Whisk until gravy begins to thicken. Add the patties back to the cooker, cover and continue cooking on high for 30-40 minutes.